Lentils and rice are a delicious combination you may not have tried. Plus, check out the protein content in the nutritional values box on the right. Lentils are a wonderful non-meat source of protein. That makes this recipe a wonderful vegetarian main course or, for us meat eaters, a perfect side dish or Meatless Monday option. I think you will really enjoy the flavors – savory onion and garlic, mild (or hot) curry and the brightness of fresh cilantro. It’s a nice mix of flavors. Cook the brown rice in 4 cups water with 1 teaspoon of salt added for 35 to 45 minutes until tender. While the rice is cooking heat the oil over medium heat in a large pot. Add the onion, garlic, ginger and curry powder. Cook for 2 minutes. Do not brown. Add the lentils and water. Cook for 20 minutes. Add the salt. Cook for 5 minutes. Mix in the chopped cilantro. Serve over the brown rice or see the note below. I serve it by mixing the rice and lentils together as shown in the picture above. If you use another kind of lentils, brown or green lentils for example, the cooking time may be a bit longer. Make sure to read the label on the bag to make sure you are cooking them long enough. You can also substitute white rice. The brown has a delicious chewy texture and is healthier, but does take much longer to cook. 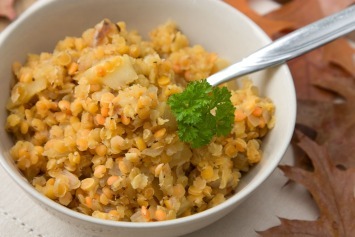 Serve this wonderful lentil recipe as the main part of a vegetarian meal or as a side dish with chicken, fish or beef. If you use this lentils and rice recipe as a vegetarian main course, have a look at more vegetarian recipes here. This is a wonderfully healthy recipe full of nutrients from every single ingredient in the list.. If you are not a vegetarian, why not try a meatless Monday?